The city woke up to a rude shock today. A portion of the historic Bahu Fort, a state heritage site collapsed at 3 am. The base of the fort gave in because of heavy rainfall over past four days. Minister for Housing, Horticulture and Culture, Raman Bhalla, has directed the Vice-Chairman Jammu Development Authority (JDA), and the Consultant Tourism and Culture to immediately start the restoration work of damaged portion of Bahu Fort heritage complex, asserting that the place was the main attraction of the city of temples. The city got respite from continuous rainfall after four days. Traffic was restored completely on the 300-km-long Jammu-Srinagar National Highway that was affected due to incessant rainfall since August 13. Damage to power infrastructure across the region left hundreds of villages and some areas on the outsk irts of the city without electricity over past 48 hours. Poles supporting the 33-KV line near Nikki Tawi have been uprooted and washed away in flood water, leaving several villages in darkness. Member of Parliament, Udhampur-Kathua-Doda, Choudhary Lal Singh today toured the flood-affected Prithi Chack, Sherpur, Kotpunnu, Nanak Chack villages of Kathua district. He was accompanied by ADC, Kathua, ACR Kathua and Executive Engineer of PDD, PWD and Flood Control Department. The Awami National Conference (ANC) has expressed serious concern over the prevailing flood situation in Jammu region. The party today claimed that incessant rains have damaged 836 residential houses completely and 2,161 houses partially, besides affecting various roads and livestock. The Chamber of Commerce and Industries (CCI) has been agitating for compensation to traders who have lost their establishments in the recent clashes in the Jammu division. Incidentally, there are traders who have lost crores during strikes and curfew for six days. With most of the Jammu region under curfew after communal clashes in Kishtwar on August 9, many people of the twin districts of Doda and Kishtwar working in Jammu have not been able to go back. Most of them had come to Doda or Kishtwar to celebrate Eid-ul-Fitr, but were stuck as they were not able to go back to Jammu to attend office. All educational institutions in the region will open on August 19, according to a statement issued by the divisional administration. The exposure draft of the National Youth Policy stated that although the existing system of education has been greatly reformed by introducing the grading system throughout the country, including J&K, but students are still facing great anxiety due to the competitive examination system. This segment is vulnerable to many mental and physical maladies. An educational tour for girls of Rajouri and Poonch districts has been flagged off by the Commandant, 25 Infantry Brigade, from the air landing ground at Rajouri today. To ensure timely measurement of works and adherence to technical standards in the execution of works under the Mahatma Gandhi National Rural Employment Guarantee Act (MGNREGA), the Ministry of Rural Development has directed all states to deploy two diploma-holder engineers per 6,000 rural households. The Chief Post Master General (CPMG), J&K, John Samuel, inaugurated a training programme “Customer First” here today. The Rashtriya Rifles Battalions, under the aegis of the Counter Insurgency Force (Romeo), held short vocational training cadres for unemployed youth hailing from border and far-flung areas of Kalai, Daraba, Krishna Ghati and Peerbaba villages, Poonch and Rajouri districts, today. The Army on Wednesday rescued a Czech couple stuck in the curfew-bound Kishtwar district since August 8. “The couple was on a trekking expedition and was stuck in Kishtwar district. State judoka Shikha Bhau has brought laurels to the state by winning a bronze medal in the recently concluded sub-junior National Judo Championship at Imphal in Manipur. 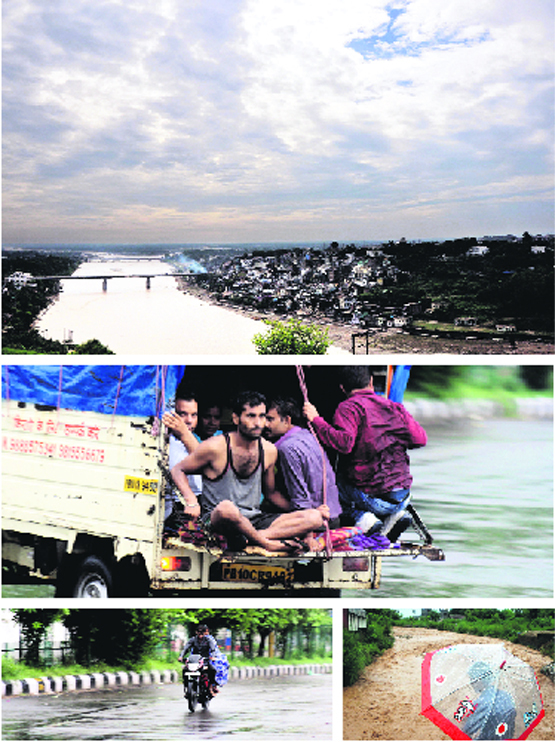 On a rainy day: (Clockwise from top) A view of the Tawi river; commuters caught in the morning rain; a man looks at the rising water level of a rivulet from under an umbrella and a couple drives through the rain in Jammu on Saturday. A cultural symbol of the temple city, the collapse of the fort has left residents in pain. The fort also has an ancient temple dedicated to Goddess Kali, the presiding deity of city and is revered by people across the region. 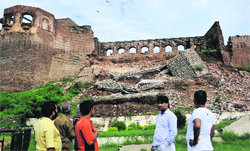 Officials said the 50 feet portion of the fort, known as Rani Mahal was under the renovation being carried out by Jammu Development Authority (JDA) under the supervision of the Archaeological Survey of India (ASI). Soon after the news spread, hundreds of residents and officials of the JDA and the district administration reached the spot. They conducted a survey of the structure for damages, as incessant rainfall had wreaked havoc in the vicinity of the structure. “Rainwater is the main reason for the collapse as a small hill on which its base stands gave way on Saturday morning. The State Archives Department and the ASI has dispatched teams to assess the damage," said Vice Chairman JDA, Satish Nehru. Bahu Fort is one of the most ancient structures in the state and is said to have been originally built by Raja Jambu Lochan 3,000 years ago. Records say Raja decided to build the fort when he witnessed a curious scene of a tiger and a goat drinking water side by side at the same location in the Tawi River. It was refurbished by the erstwhile Dogra rulers in the 19th Century, when the rein of Maharaja Gulab Singh started after the fall of the Sikh empire in 1840. Historians say the fort had survived countless sieges by foreign invaders who tried to capture the plains of Jammu, but failed to do so due to the unique shape of the fort. There was a proposal to link the fort with a ropeway from the Mubarak Mandi Palace, another heritage site in the city. The immediate surroundings of the fort have been converted into a park with fountains and a small lake for boating. “It is a big cultural loss to the city as it has remained an important symbol of Dogra identity. It was a major attraction for tourists and pilgrims visiting the state," said Bushan Parimoo, who runs a NGO to save the cultural symbols in the region. The Bahu Fort Development Committee on Saturday held a protest against the administration and the Archaeological Survey of India (ASI) for their failure to save the historic Bahu Fort. The members sought a technical inquiry in this regard and action against officials who failed to detect the weak portion of the fort. The protest was led by BFDC president Rajeev Charak. He said the fort had always been a source of attraction for tourists but the authorities had failed to save the fort. He alleged that the government had sanctioned ~69 lakh in 2010 to the ASI to renovate the fort but it sublet the work to JDA. Fort heritage complex, asserting that the place was the main attraction of the city of temples. This was stated by the minister while interacting with the officers after inspecting the damaged site of the Bahu Fort heritage complex, here today. District Development Commissioner, Jammu, Ajeet Kumar Sahu, Vice Chairman Jammu Development Authority Satish Nehru, Superintending Engineer Jammu Development Authority P L Bhushan besides other senior officers of Culture, Revenue and Jammu Development Authority were present. Bhalla said the government had sanctioned Rs 64 lakh for illumination, Jorha Garh, fencing besides renovation of ancient fountain situated in the Maha Kali temple. He asked the executing agency Jammu Development Authority to complete all the allied works under the funding within stipulated time frame. He said the government had earmarked a corpus fund of Rs 50 crore to meet the expenditure on conservation and preservation of rich heritage assets of the state, against which Rs 2 crore have been released. This amount would be invested as long and short term measures for the purpose. Bhalla said initially, three heritage sites, one each in Kashmir, Jammu and Ladakh regions, would be taken up for preservation and conservation by the culture authority. Reports said many interior roads in the region had suffered heavy damages. Meanwhile, life is limping back to normalcy in the city. The Jammu-Srinagar National Highway, which was blocked due to landslide near Ramban, was restored this morning for the vehicular movement. However, Jammu-Kishtwar road had a heavy landslide near Thathri, which was restored in the evening. According to the reports, there are many link roads, which are still disconnected and the restoration work is on. As many as 12 persons were killed in the house collapse incidents, landslides and floods, while more than 2,500 houses and cattle sheds were reportedly damaged in the past four days. There was a heavy damage to property reported in Samba, Kathua, Rajouri, Poonch, Ramban, Udhampur and Reasi, where several persons had been rendered homeless due to house-collapse incidents. The Chenab, Tawi, Ujj and other water bodies were flowing above the danger mark for the past three days, setting an alert for residents and the administration. The administration has started the restoration work by assessing the losses and hundreds of standard vehicles enroute have also been sent. Daily commuters in the city and its peripherals are facing difficulties, as many of the roads have lost their grounds, which have become a threat for them. Damage to power infrastructure across the region left hundreds of villages and some areas on the outskirts of the city without electricity over past 48 hours. Poles supporting the 33-KV line near Nikki Tawi have been uprooted and washed away in flood water, leaving several villages in darkness. Officials said it could take weeks before the power supply is fully restored in the Jammu region, particularly in the hill areas of Samba, Kathua, Rajouri and Poonch and several outer areas of the city, which have suffered immensely due incessant rainfall over past four days. Water has also entered many receiving and distribution stations but due to the continuous rains, the repair work has not been started so far. "Our network has suffered heavily as many poles and electricity wires worth crores were uprooted. It will take weeks before a final report can be received and new funds are sanctioned to restore the electricity in the affected areas. We had not expected such a situation during monsoon," said a PDD official. Chief Engineer, PDD, Sehnaz Goni, said the authorities were concerned about the devastation due to flood. "The support structure of the 33-KV power line which supplies electrify to several villages has been washed away in flood water. Reports are still being received, but our infrastructure has suffered due to prevailing weather conditions," Goni said. The flood water has also entered Sitli lift station and other water filtration plants on the banks of river Tawi, which supply drinking water to major portion of the city. Officials said as the water level was receding, the silt was becoming a major problem for the staff in these stations in smooth running of machinery. The powerful pumps lifting ground water are also working below their capacity due to the power cuts leaving many areas without drinking water for past two days. Singh took stock of the situation arising out due to recent incessant rain resulting floods in the low-lying areas of the district. He directed the ACR, Kathua, to assess the damage to the crops as well as land of the affected people. He announced 100 crates for the construction of the protection band in upper areas of Prithi Chack to channelise the flood water. He also visited Sherpur area where a portion of the road was washed away by floods and announced 25 crates for the area and directed the XEN, PWD, to restore road connectivity at an earliest. He also visited affected areas near Ujh River. ANC provincial president Gian Singh exhorted upon the officers to be prompt and extra vigilant towards their services to deal with the situation arisen due to heavy rains and flash floods in the region effectively. Singh demanded the construction of Satwari Bank on the pattern of the Chenab in Akhnoor and a project on the same line. He demanded concrete repairs of damaged banks immediately to avoid further loss. He urged the district administration to keep a close vigil on the situation to avoid further loss to life and property and appealed to access the losses of the houses damaged, land erosion and other infrastructure washed away in flood, besides providing them a compensation. Traders, hoteliers, transport and tanker associations have expressed resentment to the Chamber of Commerce and Industry, which has further given a two-day strike call for compensation to the traders who have lost their shops or establishments in clashes. Inderjit Khajuria, president, All Hotels and Lodges Association, said, "We have lost more than Rs 1 crore in the last six days. Four yatras were going on. This was a season to make some profit, but unfortunately, we cannot make it." 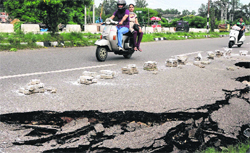 “It will take more than a month for things to get back to normal in Jammu. The chamber should also add the demand for compensation for us," he added. The business community, especially the transporters and shopkeepers who run their business with loan amount and have to pay interest on a daily basis, are also worried about their losses. Kartar Singh, a transporter, said, "We have arranged for the instalment of vehicle, insurance, road tax and passenger tax on a daily basis. The CCI should also consider our losses in its demands before the government." All the business establishments from a ration shop to petrol pumps were closed in Jammu since Saturday. The tanker and petrol pump associations are said to have suffered financial losses to the tune of more than Rs 35 lakh during strikes. Anan Sharma, Tanker and Petrol Pump Association, said, "Everyone has lost his daily earnings due to the strike and curfew. The CCI should add our compensation to that of the traders who have lost their establishments." “The government is not sincere about giving compensation to the traders. The compensation which was agreed upon by the government in 2008 is still pending. How can we expect compensation for this loss," he added. YV Sharma, president, CCI Jammu, said, "We cannot assess the loss of traders and transporters due to the strike and curfew. We are only demanding actual compensation for the traders who have lost their establishments in clashes." "The traders bear heavy losses in these circumstances. Only an ideal government can make a compensation for these kinds of losses, which does not seem to be the case," he added. Traders, hoteliers, transport and tanker associations have expressed resentment at the Chamber of Commerce and Industry, which has further given a two-day strike call for compensation to the traders who have lost their shops or establishments in clashes. It is a regular practice of Muslims in Doda and Kishtwar districts who work in Jammu or elsewhere to come home for a few days on occasions like Eid. This time, they could not go back as curfew was imposed in eight of the 10 districts of the Jammu region as a fallout of the violence in Kishtwar. They were awaiting the green signal from the administration so that they could go back and resume duty. “I took leave and came to Doda to celebrate Eid at my village. The communal tension, followed by curfew, did not let us go back and join duty," said Dr Irfan Ali Wani, veterinary assistant surgeon. He said he and his family were held up in Doda and were unable to go to Jammu. "We want to reach Jammu so that my children are able to attend classes when the schools are reopened," he added. "I had to reach Jammu by Tuesday evening to board a train for New Delhi. It may be mentioned that all educational institutions across the Jammu division remained closed due to the recent communal clashes in Kishtwar. Curfew was clamped after the clashes. The policy claimed that youth at present had to contend with frequent absence of teachers from schools and colleges. A matter of further concern was that courses were not completed on time, leading to a state of uncertainty among them. Sources said the concept of grading system was announced in J&K with much fanfare to reduce unnecessary stress on the minds of students, but people at the helm of affairs in the Jammu and Kashmir Board of School Education (JKBOSE) have failed to implement the system in letter and spirit. As a result, they are still declaring positions and marks scored by the students. The policy claimed that most of the institutions use teaching methods that were outmoded. It added that the methodology of teaching, materials for teaching, teacher training etc needed special attention. “Enable the enhanced participation of youth in the process of decision making and development. Timely conduct of union elections in all universities provide an opportunity to the youth to contribute to nation building and develop as responsible leaders as well as voters,” the National Youth Policy added. The policy said rural youth form a larger share of the youth population, but have comparatively lesser access to information, educational and career opportunities and training facilities in the state. It stated that the youth finds it difficult to compete with urban youth in terms of opportunities for jobs and higher education because of tough competition. "Full information about state policies and programmes is often not available to the youth of the country. The government has many programmes about which they have little information and therefore, the benefits of these state-sponsored schemes are not known to them. The National Youth Policy said many young people belonging to tribal communities often find themselves at cross-roads in their lives. The concept of grading system was announced in J&K with much fanfare to reduce unnecessary stress on the minds of students, but people at the helm of affairs in the Jammu and Kashmir Board of School Education have failed to implement the system in letter and spirit. As a result, they are still declaring positions and marks scored by the students. As many as 23 girls and two teachers of various government schools across the twin districts went on a tour to Amritsar, Chandigarh and Dehradun till August 26 under Operation Sadhbhavna. The education tour aims to provide an exposure to poor children of the remote areas about rich history and culture of India. During the tour, students will also get an opportunity to meet senior officers of the Army and visit historical Jallianwala Bagh, Golden Temple and many other historical places. However, North East states and states with hilly and difficult terrains such as Jammu and Kashmir, Himachal Pradesh and Uttarakhand have been instructed to deploy two engineers per 3,000 rural households. The Ministry had issued the instructions under its operational guidelines, 2013. Sources said in order to ensure adequate human and technical support at the sub-district levels in the implementation of the MGNREGA in the districts where the integrated action plan was in operation, the Central government had proposed to the state governments concerned to create a district cadre of the staff deployed with the panchayats and recruit one panchayat development officer (PDO) and a junior engineer (JE - Works) at the gram panchayat level. The sources said the PDOs would perform all duties as may be entrusted to them by the gram panchayat, supervise other functionaries, perform other duties as the intermediate panchayat, district panchayat or the state government may direct, assist the panchayats in decentralised or convergent planning under the Act by taking up participatory planning approach and implementation and monitoring of the Act. The JE (Works) will be responsible for preparation of work estimates and layout of works for construction or civil works under the scheme, obtain necessary technical and administrative approval and monitor the execution of work as per the prescribed procedure and provide technical supervision. The Ministry proposed to the state government to designate a district programme coordinator (DPC), who could be either the Chief Executive Officer of the district panchayat, or the District Collector or any other district-level officer of appropriate rank. The DPC is responsible for the implementation of the scheme in the district, in accordance with the provisions made in the MGNREGA, 2005, and rules and guidelines made there under. Sources said the demand for employment under the MGNREGA was affected by many extraneous and endogenous variables such as the lack of comprehensive knowledge about the scheme, lack of knowledge on how to exercise their rights by applying for the job, connectivity with towns or satellite towns, wage differentials, lack of infrastructure and capacity at the gram panchayat, block or district levels, delayed wage payments, availability of alternate employment opportunities in the primary, secondary and tertiary sectors and lack of knowledge about what all works could be taken up under the MGNREGA. During the programme, various activities will be carried out focusing on identification of potential customers, customer satisfaction and encouraging staff to know the relevance of customers. He impressed upon the staff members to be polite while dealing with the customers and listen to them patiently. The CPMG said the staff training programme, organising customers meet at each of the post offices will be among different activities during the customer first campaign. John Samuel said the business volumes of India Post in J&K had seen tremendous growth in the recent years. “The department is now focusing to strengthen its relations with its customers and the campaign will prove a milestone in this direction. The CPMG further added that people could write to him directly sharing their experience on postal services for further improvement and a link would also be provided on the J&K Postal Circle’s website www.jkpost.gov.in for the feedback. The duration of the cadres was from August 5 to August 17. The aim of the cadres was to impart basic skills of photography, videography, light vehicle maintenance tasks, welding and electrical tasks, which would give participants the requisite confidence to venture further in these fields on their own. As many as 63 unemployed youth attended these cadres. The certificates of participation were provided to each participant. Zafar Ahmed, sarpanch of Kalai village, expressed his gratitude towards the Army for providing this opportunity to the youngsters of the region. Shikha, who is presently undergoing an advance training at the Centre of Excellence in Sports, National Institute of Sports (NIS) Patiala, was selected on the basis of her performance at the national level. Run by the Sports Authority of India (SAI), the Centre of Excellence at National Institute of Sports (NIS) Patiala, selects young and talented players across different disciplines from all over the country to further hone their skills so that they could prove their worth at the higher levels. Enrolled in March last year, Shikha will undergo training in NIS Patiala for the next two years. All her expenses with regard to her stay and education will be borne by the SAI, provided she continues to perform at the national level. Pertinently, Shikha is the second female judoka from the state who has been picked up by the SAI for specialised training. Nippu Jamwal, who won a gold medal in the Asian Judo Championship, was the first such promising player from J&K to be trained at NIS Patiala.